Choose Chef Angelo Bersani for your Sanford Florida private dining experience. 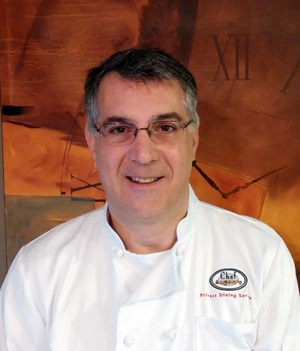 Chef Angelo Bersani is the Owner and Executive Chef. The Chef brings over thirty years of luxury hospitality and entertainment leadership experience to your table in Sanford Florida. Specializing in the best global fusion cuisines, the Chef’s passion for service and elegance is second to none. Chef Angelo is a graduate of the Florida Culinary Institute where he worked for a well-known hotel property in Palm Beach. The Chef established Chef Angelo’s Private Dining Service in 2003 and has been serving businesses, private families, celebrities and travelers from around the world ever since. Chef Angelo is a member of the American Personal and Private Chef Association.